I am totally fubar. So far behind. By day 7, my total should be north of 11k. My real goal was to be north of 15k. My reality is just over 5k, with the frustrating fact that more than 50% of what I wrote to start will end up trashed. So of usable words? I’m probably closer to 2000. Maybe less, but maybe more – salvage work will begin once Draft One is complete. This week has been insane. 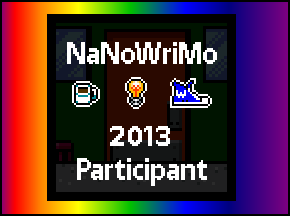 Apparently, I knew it would be long before the month actually began – thus the title of the month: Insanity 2013. UGH! Work has been one thing after another. I’m worried and stressed out and hating it, but… time will pass and I shall go back to just being neutral about it… neutral with a side of bored and vaguely annoyed. Anyway – update on “The Brink” which needs a new title because I’ve decided not to write “The Brink” this time, I’m going for a slightly different story… fantasy, a one-off, a journey/quest, a piece I hope to finish, edit, publish. I like it. Which is more than I can say for most things I write.